Day 302: Another day at the Chateau . . .
…Or in other words, we drove by the house today to check and make sure that it was still there…of course, it was. For the better part of the past two years, we’ve had other people living in our house, while we live here, so it’s with mixed feelings when we drive by and see junk on the front porch and overflowing trash cans by the garage. Home ownership is a source of pride for the both of us. Even as report after report is coming out and saying that home ownership is becoming less and less of a part of the American dream. We stand by the premise that there is nothing better than owning your own home. It allows you the freedom to do with it in any way you’d care to. It gives you the opportunity to landscape it; paint it; decorate it; make it your own. When we drive by our house–and the folks living there aren’t taking care of it the way that we would–we wonder if we’ve done the right thing by renting it out. It’s a hard decision in a challenging economy to forgo the cash flow of renting in favor of selling especially when the length of time needed to sell the property tends to run 6-9 months. As we drove by today, we got a little bit closer to deciding what direction we want to go. But, what got us there was a haircut for Jean, and a visit with P&L at Grape Juice for lunch…and a bottle of wine. It’s always nice to stop in and see how things have changed; grab some grub and enjoy a bottle of grape juice. For the record, if you’re ever in the Kerrville area and need a great place for lunch, Grape Juice has a terrific lunch menu at reasonable prices – a tip of the hat to Patrick and Keri…but it’s the wine that brings us back. While we were sitting there, it was great to see a good friend–they recently sold their business in town and looked terrific. 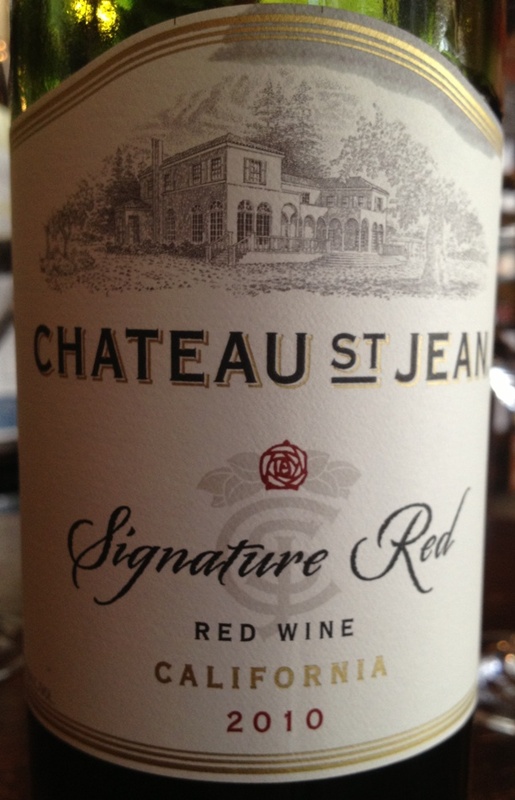 We decided to try one of their menu wines, a 2010 Chateau St. Jean Signature Red wine from California. The wine was pretty rough when first opened. . .you know, that puckery feeling you get in the back of your jaw when something sour hits it. While this wine was quite that bad, it was pretty close; however, there was a really nice tasting of fruit left on the finish that gave hope as the wine opened up. A blend of Cabernet Sauvignon, Merlot, Zinfandel, Petit Sirah, Syrah, and Malbec which shows plush notes of blackberry, mocha, and spice. Wine displaying a sensuous, deep purple in the glass, this fruit showcases the sophistication of the five varietals in style along with a nice roundness and a spice element. Priced at around $18 a bottle, it’s actually a little overpriced for what you get. We’ve enjoyed better wines for less money during our 302 days thus far, but on the upside this wine got better as the afternoon wore on. At the end of the day, we’d probably opt for a different selection, but are glad that we’ve tried it. . .around these parts it was HOT today! Driving back to SM, the car thermometer showed 108 degrees outside! And, really, does it matter if it was really 102 or 104 degrees instead of 108? Could you really even tell the difference? Probably not! We really enjoyed seeing some good friends again today and sharing wine with them. We hope that as your weekend winds down tomorrow that you’ll enjoy your favorite wine responsibly and remember to recycle whenever possible. Categories: Uncategorized | Tags: Chateau St. Jean Signature Red, Grape Juice Kerrville | Permalink.